Argentina went through a key historical moment in the nineteenth century; in 1816 it acquired its independence. With it came many issues. Amongst them were disputes about having a centralized or a federal government (one of the causes of the civil war), boundary disputes (one of the causes of the Triple Alliance War, and the Conquest of the Desert), and later, with the expansion of the territory the need for populating the deserted areas and modernizing the country which led to migratory politics that gave incentives to Europeans so that they would relocate in Argentina. All of this led to probably one of the most important issues of the century, which was the imminent need for a national identity that would make people feel a part of the new country. Throughout this period art played a very important role. Artistic institutions such as the Sociedad Estimulo de Bellas Artes and the Museo de Bellas Artes were founded, and the first postcolonial Argentine artists appeared. On one hand art documented the different defining historical events, and on the other, it helped build the cultural identity by creating its imagery and visual language, which was of course mostly influenced by the European tradition and immigration. Some of the most relevant artists of this period were Pridiliano Pueyrredon, Candido Lopez, Eduardo Sivori and Ernesto de la Carcova, amongst others. Pridiliano Pueyrredon was both artist and arquitect. He worked on many of the city monuments, the Casa Rosada and the design of the presidential house in Olivos. As an artist he painted many portraits of the Argentine aristocracy, and later on took the pampas and the campo as his theme, exploring the figure of the gaucho. The gaucho was one of the mythified figures by literature and art that was taken as an emblem of Argentine identity. Candido Lopez began as a photographer and then developed into a painter, he was also a soldier. During the Triple Alliance War against Paraguay he lost his right arm and so he mastered his left hand to paint the many battlefield scenes he had sketched. His large horizontal paintings depicted simultaneous actions as well as surrounding nature and are characterized by the detail of the many miniature figures that comprise them. A large collection of Candido Lopez’s work is exhibited at the Museo Nacional de Bellas Artes. 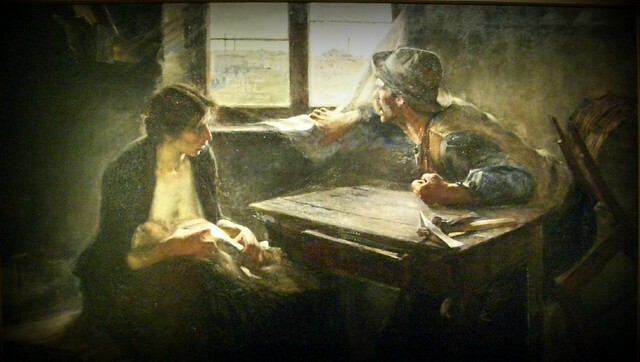 Eduardo Sivori is considered to be the country’s first realist painter. He was influenced by the French art scene after traveling there in the late 1800’s and was active in the local artistic circle having founded the Sociedad Estimulo de Bellas Artes, along with the symbolist artist, Eduardo Schiaffino. His works depict Pampa landscapes, nudes and portraits of many different subjects. After his death the Museo de Artes Plásticas Eduardo Sivori, destined to promote Argentine art, was founded in his honor. Ernesto de la Carcova, after whom the national university of fine arts was named, was a very talented painter who presented two aspects in his works. On one hand, his earlier work showed a strong social content as is the case of the internationally acclaimed Sin pan y sin trabajo, on the other hand, his later work, which accommodated to the demands of the local market at the time, that depict still life’s, nudes and portraits. He was also an important public figure in the art world and took part in many monuments, as well as in public artistic education. He was a very respected artist at the time and was in charge of acquiring European art for the city. Some of his paintings are exhibited at the Museo Nacional de Bellas Artes. This entry was posted in Argentine Culture, Art and tagged argentina, Argentine Art, argentine indpendence, buenos aires,, exhibits, national identity, nineteenth century, wars by Fierro Hotel Staff. Bookmark the permalink.